Specifically for Women! Tips & Techniques to: Overcome your fears, shift nervousness, have fun, and shine with confidence! 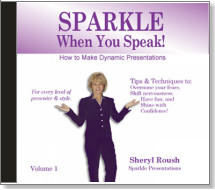 Ideal for every level of presenter, speaker, trainer.